Wednesday 22nd. October, 2014 – Getting along like a house on fire! Thursday 16th. October, 2014 – A Day out for the boys! Today was a beautiful day. I got up, walked Mix and breakfasted in the farmhouse. Neither David nor Tom were here this morning so I worked on in the bothy on my own and enjoyed it immensely. Olive and Digger had driven up to Kirkcaldy for the funeral of the father of one of their friends, while Rachel was working in the Stables. 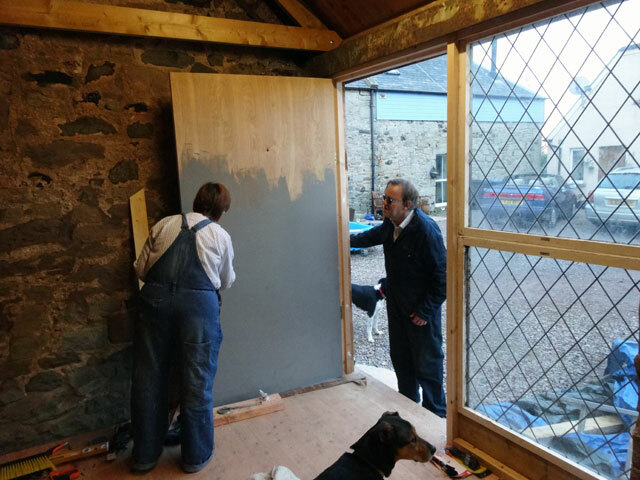 Around lunchtime both Tom and David arrived and we continued on the bothy – Tom fitting the ironmongery to the bothy door. We cleared out the bothy in preparation for the wood for the wall-cladding which will arrive tomorrow and we stacked the timbers for the wall-framing. Then, while Tom was continuing with the ironmongery, David, Rachel and I rummaged in the Hen House to discover the sails for Olivebank. We found them and checked them over, repacked them and set them aside ready for the sailing season next year! Rachel started giving the new door a coat of undercoat paint, David drank coffee in the summer house, Tom went off to prepare tea for the family and I prepared all of the music for Arrochar Church’s service this Sunday. Rachel and I dined in the farmhouse and in the evening we watched the final part of Scott and Bailey – it has been an excellent series (and ended in a satisfactory manner) – before walking the dogs and retiring to bed.